I just read that you are pregnant with twins and that is making me extraordinarily happy. I am grinning and know exactly how you feel. Anyone who has gone through infertility is probably reacting the same way with universal delight. Having a baby, for many people is a long and rough road, not to mention painful, expensive and emotionally draining. I should know, it took two and a half years to become pregnant with our first child. When I was going through the infertility process 20 years ago, nobody talked about it. The only people you talked to about this gut-wrenching secret with were the other women you met in the infertility clinic and your husband. Having children had always, always been my dream for life; not having them felt inconceivable (no pun intended). Years ago, I felt humiliated and embarrassed, depressed and without hope. That’s not a good feeling every day, every month for over two and a half years; I remember it being one of the most depressing parts of my life because it felt like the death of hope. I got pregnant with my son two and a half years after we started trying, with help. Then, like thrilling magic, without infertility treatments, I got pregnant with our daughter, twelve months after our son was born. It is a feeling no one understands until you have been through it. Believe me. Today, it is not the shameful secret that it was 20 years ago. It wasn’t discussed on television or written about in magazines. It was whispered with hushed silences and every day there were reminders of what we did not have. Everywhere I looked there were glowing pregnant women and adorable infants, baby carriages and pregnancy news 24/7. It’s like when you first need prescription glasses and suddenly realize how many people wear glasses. At least now, there are support groups and people to lean on that understand the experience. When something is kept a deep, dark secret, you feel you are all alone. Congratulations, dear Celine. I am rooting for you and your precious family. I understand how it feels to go through the infertility process. You are 14 weeks pregnant, may you have a safe and healthy pregnancy. We all love happy news ; you bring us joy, you give us hope. We wish the same for you and your family. I think I may just have to live an old life, actually a much older life at a slower pace, a gingerly walk and question mark for every day. I may need to stop all the medications I take for my auto immune disease, Hashimoto’s Thyroiditis, and inflammatory disease and just live with even less energy, more aches and pains and even more inflammation. It wouldn’t really matter, I don’t think, because with all the medicines I take now, I still feel those things. I feel those things every day along with nasty side effects from the prescribed medicines. I am not drowning in the ocean, nor am I swimming powerfully, I am mostly trying to manage to keep my head above water. I am not depressed or suicidal, I am not happy or ecstatic, I am just living in a state of symptom to symptom, energy for an hour, napping, reading, napping and tired. I don’t notice much improvement, if any, from the medications to begin with. Can I go from bad to worse? Possibly. Can I learn to adjust to that? Maybe. The lack of energy is probably the worst part, I can live with aches and pains and holding on to staircases to get up the stairs. But, when a beautiful day presents itself to me as a present, like today, I cannot live, not knowing what or if I can do anything at all. It’s not fair to me but mostly it is not fair to my husband and I feel bad about that. It’s Sunday of Memorial Day weekend, the sun is shining, the sky is a pastel blue, the bountiful green oak tree leaves are swaying softly. Birds are serenading us with their sweet high-pitched songs. My husband and I had no plans for the entire day and he was up to doing anything. Go to the city? Go to a park? How about a museum? He was willing to do whatever I wanted to do and having my now familiar stomach ache (side effect of the medication) and being tired, I chose a nap. There was no back and forth discussion of which place to go or what would be more fun because of me. The bar is set so low that staying home sometimes is my only option. I don’ t know what to do, other than go on one more expensive tour of doctors again. I will do it, I will try, for the last time. After that, I don’t know. I don’t say that with depression or despair, it’s an option I need to consider. I live a sedentary life now, truly, if I have two hours during the day that I feel energized it’s a good day. Lately I haven’t even felt that. I’ve been stuck at home, happy just to be alive. Do I think it’s fair? Not really but I don’t think it’s unfair either. People live with far worse things. I find it frustrating and disappointing that I have lived life like this for the last three years. I awaken, each morning, with a question mark, to see if I feel better, but it hasn’t happened yet and I don’t see it happening anytime soon. Is it is better to deal with a new reality and no side effects than be stuck with the old one? I have no idea. What am I going to do? I honestly don’t know. I need help, more doctors, different doctors. no doctors? I am feeling a little overwhelmed and I think what I need the most right now is a positive attitude and plenty of of good luck. Dedicated to my wonderful husband, Danny. When I was young and canned fruit cocktail was served as my dessert (barbaric, I know) I would eat my fruit cocktail with enormous precision and I would never, ever, vary my personal style. First, I ate up all the chopped peach pieces. After that came the pears. If there was a random pineapple that came next. Grapes were the next to eat, one at a time, each squishy piece exploding (a slight exaggeration) in my mouth and after that, well, what can I say, the ultimate reward, the fake bright red cherries. The cherries were the charm, the gift, the prize. They were ALWAYS left for last. Last night, after years of not having fruit cocktail at all, I decided to have some. It looked so comforting and soothing. I opened the can (by the way, I noticed that all the good stuff is at the bottom of the can) and poured the “lite” mixture in to a shining, blue bowl. As I looked at it I stopped to think, and then question. Why should I leave the grapes and cherries for last? Life is short, enjoy the fruit whichever way you want. So, I started eating grapes with peach pieces or pears with peach or cherries with grapes. It didn’t matter, I ate with no strategy. I just ate. I mixed it up. What I found out is that a) I am now a bona fide old person and b) the fruit pieces really all taste exactly the same. It was a little sobering, a tad bit shocking and definitely disappointing. Also, not having that luscious, heavy, thick, high fructose syrup that we used to always drink when I was a child was like replacing fruit nectar with slightly sweet water. I think the world was a better place way back when. So, do your thing. There’s no use saving the best for the last. The last could be now. Eat what you want (yeah, yeah, in moderation) and try to enjoy the little things in life. Dwell on the good things, not on the bad. If you want to eat the cherries first, you can. Do what makes you happy and more importantly, try to make other people happy. Carpe Diem. I should have known better than to watch American Idol this season after all these years. 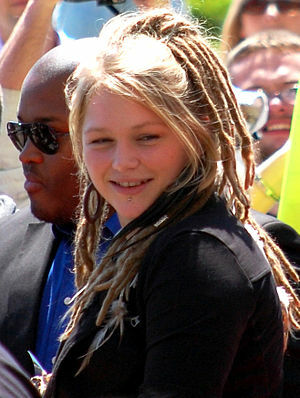 I wanted Crystal Bowersox to win, the clear favorite who wowed the audience (and the judges) with her 3 performances last night and for most all of the competition. I voted. I voted ten times to try to help. Then, I hear Simon Cowell on The Ellen Degeneres show predicting Lee DeWyze as the winner. There were also articles written on how Crystal wouldn’t win…”can’t people be silent for at least 24 hours before the voting? Is America not ready for an indie artist who also happens to be a single mom? Half hippie, half eclectic, this young woman’s voice is unbeatable. So she wore her hair in dreadlocks, so what? She has a marvelous range and her singing is clear and simply delightful; like the call of the morning birds or a beautiful pond you just discovered. You can’t help smile when Crystal takes the stage. Apparently, people felt more comfortable with Lee who as the judges always commented “came from working out of a paint store.” Does that really matter? How about Crystal? A single mom working to make ends meet and having a tough life? My only consolation is that in the past some winners were not as successful as the first runner-up. Remember Ruben Studdard? Barely, his runner-up was Clay Aiken who produced a lot more than Ruben ever did. There were plenty of others as well. This is my gripe: Crystal was definitely a better singer than Lee, throughout the entire season. So, why did she lose? Last night, it was obvious that she was the leader, all the judges giving her props, the audience practically hugging her along with her powerful voice. Crystal drew people in. At least to the people who would LOVE an indie-style artist (yes, I said artist) that may look a little different or have the courage to voice her opinions. America? I’m disappointed. Were you just not ready for an original artist? Really? Please remind me in the fall not to tune in because I am tired of rooting for the best artist and having the more: “popular”heartthrob artist win. Crystal: I’m counting on you to have an absolutely magnificent career, a recording contract (probably with Simon Cowell) and lots of money to spoil your sweet, blonde-haired son. As for Simon Cowell, I will miss you and I think the tribute to you was magnificent and well-deserved. As for Paula Abdul’s appearance, all I can say is “Awwww.” It was nice to see her again, looking so pretty in shocking pink puff. Good luck Simon, not that you need it. Cheers! Lee, congratulations for being the winner. Crystal, congratulations for being the champion. I was feeling so proud of my blog last night, the 104 entries, the fact that I stuck to it, it was my challenge and it was my accomplishment. It was my biggest accomplishment after, of course, the births of my son and daughter. Last night however, things changed and I have the painful stomach ache to prove it. After hearing a lecture in school on Internet safety during Seminar Day, both of my children were made aware of the dangers of their photos, ANYTHING on the internet with their names attached to it. Inconveniently that same day I wrote a blog about my two teenagers because both my husband and I were in bad moods and felt incredibly cranky. First mistake. To those of you who read my blog called “Cheeseburger On The Lam” aka “The Teenagers” let me tell you that I shouldn’t have written it. I want to apologize to my children for publishing something that they took offense to. I have been feeling sick, really sick and stressed out all day because of it. Honestly? I didn’t think it was that bad, just cranky parents needing to let off some steam. But, my children took offense to it and I deeply apologize for that. It was a mistake, I now know, to publish it, because they were very angry, defiant and upset about it. I was hoping the audience were parents of teenagers that could possibly relate and to those people who are also unemployed and tense. Unfortunately, the audience of two that mattered the most to me, were my children. Thanks Seminar Dude. You ruined our evening and I do not, repeat not, think you were referring to vague references of sons and daughters written by a cranky parent! It started a prosecutor extravaganza which was no fun for anyone that lasted a good hour. Before I even published it I even sent the blog to my husband asking him if he thought it was okay to publish, he said it was “Excellent!” So, I published it but what I really should have done was just thought about it a little longer. If I copied my husband and asked if it was okay, then maybe I was ignoring my own, deeply hidden thoughts or questions of judgment. I really don’t know. So, here in print, I would like to apologize to my children for offending them. NOTHING is more important to me than these two amazing children. Children who bring such utter joy to my life. I would do nothing to hurt their feelings on purpose and if I did than I am deeply ashamed. The buck stops here. I love you both more than my life. The thought of upsetting you made me feel horrible all day; yesterday’s meeting was not fun for anyone. I hope you accept my apology and now we can move on. Parents make mistakes, just like every person. As I’ve always taught you, if you have done something wrong, just be honest and apologize. Back at you. *******P.S. SORRY DAUGHTER FOR THE “OTHER ONE” TOO! Today was such a stressful day from 6:30 am until 6pm that Dad and I wrote a note to you while you were still gone this afternoon and snuck out for a burger. Together. On our own. An unexpected date night which we haven’t done for months. Nothing fancy either and with a 20% coupon in hand the stresses of our day seemed to melt like the cheese in the barely warm potato-leek soup that we shared. We were all in foul moods: it’s that time, you know that school is ALMOST over but there’s still a lot of stress, tests and finals etc. to get through first. We really do understand, truly, but both of you have been amping up your obnoxious quotient with your pre-camp attitudes and it’s being to wear really, really thin. Mostly, because it’s constant and in stereo, both of you, on, all the time. Supporting one another is great but we really are not the enemy. We KNOW you can’t wait to get out of here to go to camp…..ever wonder what we think or how we feel or how that MAKES us feel? Couple that with Dad and I being alone during the day 24/7 because of unemployment and you can hear the rumblings of claustrophobia, desperation, depression and anxiety. Not fun. With the economy the way it is, Dad has been home trying to find a job now for more than 8 months. Kids, we want you to have a good life, a happy life and you are both in High School, one a Junior, the other a Sophomore. College is hurtling itself towards us like a tsunami. We have given you both the parameters of what we can afford to pay, the rest is up to you. I wish we could do more but we can’t, that’s called reality. Times are hard, times have changed, times are actually really bad. We’re doing the very best we can. I don’t know if you realize that you both are pushing the limits, testing boundaries and talking with utter disrespect (and yes, I do mean all the unnecessary curse words) that you both use with wild abandonment. Enough already. We are “parents “and we are tired, really tired and we try to hide the stress from you as much as humanly possible but let’s face it at 16 and almost 18 you know that stress exists. Please try to deal with it the best way you know how. Apparently, “parents” are not allowed to experience stress or be tense and upset, this disturbs the teenage sensibility of “all me, all the time.” We’re sorry. Life does not work that way. Tonight my daughter shined with the satisfaction of accomplishment and goodness but she couldn’t outshine me, her mom, who looked at her with the greatest of love and pride. She’s a leader though I am not sure she knew that until recently. She was always, ever since she was a baby, doing her own thing, to the beat of a different drummer; she followed her own drumbeat and didn’t care what others thought. When it was time to graduate nursery school with all her little classmates, Jillian insisted on wearing her blue Cinderella gown to the ceremony, there was no talking her out of it and in the end, I’m glad she knew what she wanted so strongly. She hasn’t changed. When I saw my daughter tonight at the Relay For Life, Cancer Foundation Event, with her arms outstretched to hug me I wanted to hold her tight and never let her go. “I’m so proud of you” I murmured into her soft blonde hair. And I am. She collected over 1100 dollars to donate for cancer research but it’s so much more than just that. She has developed into a beautiful, strong, young woman with conviction and strong emotions, strong principles and an incredibly large heart. If you’ve never been to a Relay for Life activity you are missing out. Everyone seems to know someone living with cancer or has lost friends or family because of it. This event is to honor and remember all friends, family, loved ones. It is a such a moving ceremony and the kids in high school organize it. My daughter being one of those organizers. There is a Survivors dinner and a Survivors walk around the track; it begins with Melissa Etheredge’s beautiful song, blaring over the speakers “I Run For Life.” Last year I bawled seeing my friends walk around the track. This year I was smarter. I clapped and shouted to cheer them on, I didn’t cry or let them see me cry this year. This was their night to shine, not mine to distract. I am honoring them in their fight, I am mourning the people I have lost to cancer. At 9:30pm when it is very dark out, the luminarias are lit. Luminarias are white paper bags that you pay ten dollars for in order to honor or remember a loved one who has or had cancer. They are filled with sand and placed around the track with a candle glowing in each one. You can write an inscription on them or decorate them. I didn’t see the one I bought for my friend I lost to cancer this year, but it didn’t matter, I’m sure she knew, it was there. There were many bags for a friend of mine who is has been living with cancer for a number of years now. Her daughter, and now her son, lead the event. To see their whole family, arms around each other, walking together during the survivor’s lap was both heartbreaking and beautiful. I think of this friend all the time; I made her family dinner quite often when she was sick so she didn’t have to think about food. I tried to nourish in whatever way I could; in whatever way she let me in and allowed me to help. Another vision in my head this year, that will stay with me forever, was a mom or a friend of the mom who take a picture of one of the luminaria bags that had been written by their children in memory of their dad. That image will stay with me forever. She kneeled down on the track and used her cell phone to take a picture of the luminaria, that was written with “I miss you Daddy” and covered with red hearts and yellow flowers. I feel thankful and blessed that I can go to the event and when we leave, we leave with an emotionally packed heart and never with a dry eye. The girls on my daughter’s team and all the other teams sleep over in tents though sleep is a questionable word. My daughter swears she will pull an all-nighter and when my sweet, strong and amazing daughter says she will do something; it happens; no question about it. I am in awe of my daughter and I admire her, for the person she is, the person she has become. A lovely and beautiful young lady with compassion and tenderness and yes, great individuality and strength; a star, whose life makes mine shine brighter. Just tell me now. Tell me that Oprah is not a fake and that all these statements written in the book by Kitty Kelley (which I admit I am reading) are NOT true. But, if a die-hard fan like me is starting to doubt and question than I have a feeling a lot of people are. I consider myself the pulse of America and I am not bragging about it. I’m afraid to say that I am not only reading the book but devouring it. After 300 pages, I am beginning to be a tiny bit suspicious of my hero, MY legend, my spiritual leader, Oprah. Oprah, please say it ain’t so! I’m starting to question everything: did Oprah decide to end her show because she knew the book was being published and didn’t want to deal with issues in the book? No, of course not. Maybe? When Oprah tells people to “think big” and “imagine yourself with your goal in hand” Oprah was MY goal. I saw myself shmoozing with her and becoming friends with her, cuddling her dogs, sitting in her lush sofas with my feet crossed under me. Granted I’m sure 30 million other viewers feel the very same way. Don’t tell me she isn’t friendly, don’t tell me she made up “stories” or even “exaggerated truths.” I refuse to believe that. I think. I haven’t give up on Oprah, I refuse to. It would be too devastating and I have not finished the book yet. I’m hoping for a happy ending where the author confesses she really does love Oprah and perhaps confesses her own exaggerations of the book but I am not feeling that. Oprah, I’m still here, and I’m still rooting for you. But, I admit, I have a few nagging strands in my stomach and in my brain making me feel a little scared and apprehensive, maybe even a tiny bet annoyed. To me, you’ve always been “The Secret” the key to knowing what was right and what was wrong and I still look up to you tremendously. You have changed lives, you have housed the homeless, you build schools, you help millions by suggesting books (although some of the choices written by your friends are a little questionable) you give away cars (ok, that one was a little over the top) and you give great gifts of the things that YOU love to others. Convince me that you are sincere and that all the literature written about you is total trash. Because, unfortunately, the book seems to make sense. At times. Oprah, give me a sign. Tell me to “live my best life” (copyrighted apparently by Oprah) and let me have my own “A-Ha” moment (also copyrighted by Oprah.) Give me a “Harpo Hook-up” (ditto, see above) or an “Oprah Make Over” (same, copyrighted by Oprah). Invite me to come on your show and really talk to me. Please, make me a believer. Again. Kids grow up so quickly these days, one minute you are holding their hand at the bus stop for the first day of kindergarten and the next, it seems, you are handing over the keys to your car. They are connected to you, and they will always need you but it changes as they get older. It’s a transition, for everyone. I never thought that it was possible but you do get used to your children/young adults separating from you. You have no choice; it happens quite naturally; although, believe me, I still sing “Sunrise, Sunset” at every opportunity. The quick-dash of our 17-year-old son flying out the door so he can play whiffleball with his best friends, a game they have played for many years. They built and designed the playing field with lighting that could attract a Madison Square Garden concert, with bases that the Yankees would be proud to play in. The initiative to do it on their own, drive to Home Depot a number of times, to thoughtfully design and build it; that made it special; that made it their own and they will always have that, in later years, they will have their memories. They talk these days are about colleges, SAT’s and AP tests and how school is “technically over” with the exception of finals. The summer brings a much-needed refuge from exams and adult decisions and the dreaded common essay. These group of friends will be entering their Senior year of High School in the fall and things will proceed full speed ahead from then on, and yes, it will be different. The posse will be going in all different directions for college but I have no doubt that they will always be friends. That young, empathic, compassionate boy that he was is now grown and channeling his inner gifts to want to help others. He has his goals set on being an ER doctor or a surgeon; I tell him he has plenty of time to decide. He may not be the best athlete on the whiffleball team, he may even be one of the worst players, I don’t really know but it doesn’t matter to me. He calls, after his game, to ask if I want anything from the ice cream store. He walks in, fifteen minutes later, dusty and tired and grinning, bearing a scoop of vanilla cake batter ice cream for me, his mom, with rainbow sprinkles. In my eyes, he is, one true champion. What better way to celebrate my 100th blog than to talk about one of my favorite topics: food. Glorious, delicious, dance in my mouth food. I confess, I love food. Not just any food but good food, preferably in a restaurant with no dishes to wash after the meal. Due to the economy we go out rarely but this was a special day. A worthy celebration; this was Mother’s Day! To moms everywhere, I applaud you, we know how important we are, every day. Just thinking back at the Mother’s Day dinner at The Lex makes me drool excessively. We hadn’t been to this particular restaurant in years, often commenting that the food was always good but it was always the same. No specials, nothing new, ever. Much to our incredible delight (and I’m talking about my audible squeals of excitement) the menu had been expanded. The quality of the food, was always very good. I honestly can’t say that I’ve ever had a bad meal there. Consistency is one of their virtues. Waiter/Waitress service, not so much, but we were here to linger and enjoy. As soon as we sat down they brought us a bread basket with a sour dough/Italian type bread, bread sticks and crackers topped with poppy, and sesame seeds, and a dish of olive oil for dunking. How can you NOT be happy right away and yes, they do refill graciously (ask my teenagers). My daughter and I shared a delicate chopped arugula salad to start. It was simple, fresh and very light. It was served with slivered almonds, goat cheese and I want to say small pieces of hearts of palm. The crunchy and the smooth all wrapped up in one perfect bite. They even divided the salad into two plates which is really, a very nice touch. The dressing was lovely, (olive oil? a hint of lemon perhaps?light balsamic vinegar?) I’m not sure but a perfect partner to the salad. The salad did not drown in the salad dressing nor did we have to pick up individual leaves to see if there was dressing on it. It may seem like a small thing but perfectly dressed salads are not that easy to come by. It was a first course that seemed to cleanse my palate and make me hungrier for the main dish. Luckily, we were not in a rush. I ordered lobster ravioli in a light cream sauce with peas and mushrooms, delicately intertwined and the combination of the flavors made me crazy happy and I swooned. My daughter, who is a vegetarian, ordered butternut squash ravioli that was served with a sweet, apple cinnamon sauce. Sound crazy? Maybe. It was out of this world. Tender, sweet, the consistency of the ravioli played so nicely with the thin apple cinnamon sauce. The staff also went out of their way to make this dish for her because it was not on the menu that night. Nice. My husband and son shared the Thai lettuce wraps with chicken for an appetizer and the small tidbit I got was flavorful, and spicy. My husband ordered lamb for his main dish (could have done without seeing the lamb leg) which he said was excellent but looked like something Fred Flinstone would have eaten happily. It came with roasted asparagus and mashed potatoes. Our son ordered a nicely done steak that he devoured, it came with a baked potato and broccoli which, of course, he didn’t eat but i did. Teenagers. For dessert, our son had the apple-cinnamon crisp, the thick crumbly topping sweet and the texture perfect, hard but moist. A perfect balance. Our daughter ordered the brownie sundae which looked more like an elaborate cake than any ordinary brownie. Judging by the scrapes of her fork on her plate, she approved heartily. She ate it so quickly there was not a piece available for me to taste. I wouldn’t ordinarily order dessert but (ok, stop roaring with laughter now) what could I do? It was Mother’s Day and I didn’t want to appear anti-social. I also couldn’t resist a piece of red velvet cake with cream cheese frosting served with vanilla ice cream. The texture and the smooth flavors melted into my mouth; the cold vanilla ice cream, the rich, moist, smoothness of the red velvet cake. I don’t really know why they call it red velvet and I don’t really care, it was exquisite; that’s all that matters. I wish Mother’s Day would come around more than once a year. I desperately want to go back to the Lex for dinner. Thanks to my family and The Lex for a lovely Mother’s Day. Next year, same time, same place, great love.